OWU senior midfielder Peter Hamblett, right, was a first-team all-region selection and was named the region’s Defensive Player of the Year. Six Ohio Wesleyan University men’s lacrosse players were named to the All-West Region teams by the Intercollegiate Men’s Lacrosse Coaches Association, it was announced by the IMLCA. Senior midfielder Peter Hamblett (Portsmouth, N.H.) was a first-team all-region selection and was named the region’s Defensive Player of the Year. Senior defenseman Aaron Carroll (Baltimore, Md./Gilman School), junior attacker Steven Hildebrand (Berwyn, Pa./Conestoga), senior midfielder Luke Leyden (Northfield, Mass./Northfield Mt. Hermon), senior goalkeeper Ben Rigger (Decatur, Ga.), and junior attacker Max Tennant (Englewood, Colo./Cherry Creek) also were first-team all-region picks. Hamblett finished the season with 32 ground balls and 10 caused turnovers this year, and contributed 14 goals and 12 assists on the offensive end. Carroll, a starting defenseman, and Rigger, the starting goalkeeper, joined Hamblett in an Ohio Wesleyan defense that compiled a goals-against average of 7.74. Carroll had 48 ground balls and 17 caused turnovers this season. Rigger led the North Coast Athletic Conference in saves percentage (.551) and ranked second in goals-against average (7.68) this season. Hildebrand led the Bishops and ranked second in the NCAC with 96 points on 55 goals and 41 assists this season. He ranked second in the NCAC in assists (1.95/game) and points (4.57/game) and eighth in goals (2.62/game). Leyden led Ohio Wesleyan midfielders and ranked fourth on the team in scoring with 31 goals and 13 assists this season. He was a first-team all-region selection in 2017 and 2016. Tennant set Ohio Wesleyan and NCAC records with 79 goals this season and added 8 assists for 87 points. He ranked ninth in NCAA Division III and led the NCAC in goals (3.76/game), led the NCAC in game-winning goals (7), and ranked third in the NCAC in points (4.14/game). Ohio Wesleyan finished with a 17-4 overall record. The Battling Bishops won the NCAC championship with an 8-0 record in conference play, then advanced to the quarterfinals of the NCAA Division III tournament. 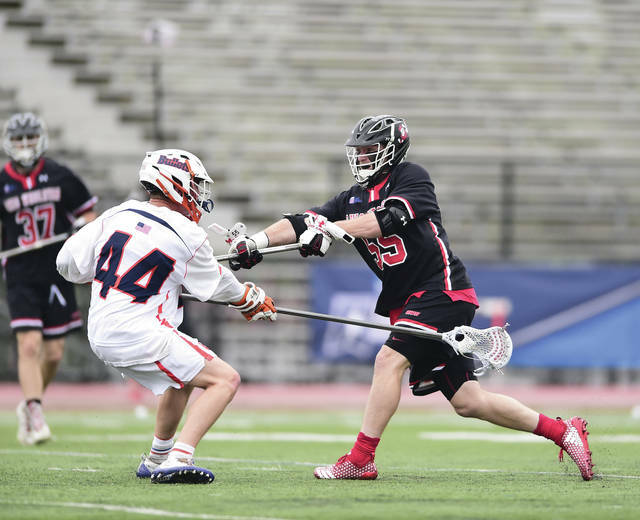 In addition to his All-West Region recognition, Leyden was named to the United States Intercollegiate Lacrosse Association Scholar All-America team. A total of 76 student-athletes from NCAA Division III institutions were recognized. To be considered for the Scholar All-America team, a student-athlete must be nominated by his coach; must be a student with a senior-year academic standing and a cumulative grade-point average of 3.0 on a 4.0 scale; must have behaved in a manner that has brought credit to himself, his institution, and to college lacrosse both on and off the field; and must be an All-American, a member of a North-South team, or an outstanding league or conference player.